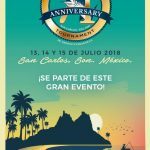 When are the Fishing Tournaments in San Carlos Mexico? May 24 – 26. The Ladies International Fishing Tournament. May 31 – June 2. The Rescate/Yacht Club Fishing Tournament. June TBA. 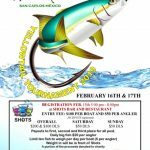 MarinaTerra Dorado Derby Fishing Tournament. July TBA. 72nd International Billfish Tournament. October 11 – 13. San Carlos Hammer Down Tournament. Looking for big game fish? Then you’ve come to the right spot! In San Carlos Sonora there’s great fishing all year long — from Yellowtail to Marlin. Come try your luck in one of the many tournaments. Read the weekly fishing report. Click for information on San Carlos’ two Marinas. Wondering where to buy your Fishing Licence? You can buy it online here. 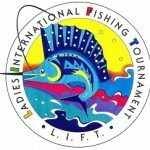 The Annual Ladies International Fishing Tournament takes place on May 24-26, 2019 (Memorial weekend) in San Carlos Sonora Mexico. 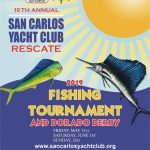 The 13th Annual San Carlos Yellowtail Fishing Tournament will take place on February 15 – 17, 2019. Details here. Since the fishing and the weather is better in October, the San Carlos Labor Day Fishing Tournament will take place October 5 – 7, 2018 this year and the name will now be The San Carlos Hammer Down Tournament. 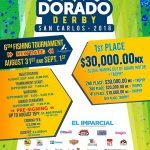 Schedule and details of the 6th annual MarinaTerra Dorado Derby Fishing Tournament: Aug 31 – Sept 1, 2018. Registration, times, prizes. The 71st International Billfish Tournament takes place from July 13 – 15, 2018. Registration, schedule, rules. On Saturday, March 19, put your free diving skills to the test in the 8th Annual Yellowtail Open Spearfishing Tournament. The entry fee is $50 USD which includes a tournament rash guard and a raffle ticket for thousands of prizes. 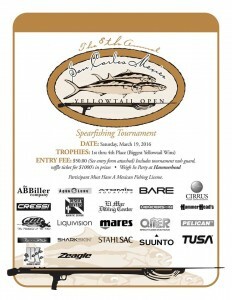 Trophies will be awarded to the 1st through 4th place winners of the largest yellowtail speared.